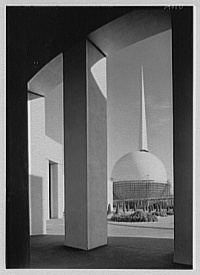 The 1939–40 New York World's Fair a World's Fair held in New York. Many countries around the world participated in it, and over 44 million people attended its exhibits in two seasons. The NYWF of 1939–1940 was the first exposition to be based on the future, with an opening slogan of "Dawn of a New Day", and it allowed all visitors to take a look at "the world of tomorrow". Seen by its organizers as an antidote to the despair of The Great Depression by projecting a future of hope, the Fair emphasized international cooperation and the impact of technology on the world of the future. At the time the Fair was a cultural phenomenon which attracted 45 million visitors in its two years of operation. After its first summer, when projected sales were lower than hoped, ticket prices were reduced significantly and the Fair's often heavy-handed themes were changed. After the second year, however, total visitors were 5 million less than anticipated and the Fair's corporation subsequently declared bankruptcy. It gave the world Futurama and the Trylon and Perisphere. Unless indicated otherwise, the text in this article is either based on Wikipedia article "1939 New York World's Fair" or another language Wikipedia page thereof used under the terms of the GNU Free Documentation License; or on original research by Jahsonic and friends. See Art and Popular Culture's copyright notice. This page was last modified 08:25, 4 April 2013.